Do you have a doll product that you would like to have featured or reviewed on AG Doll Play? We would love to write up a review or host a giveaway here on AG Doll Play sharing about your product or service assuming that it's related to dolls and has our audience in mind. If interested in having us do a review, having us host a giveaway or having featured ad space for your site please contact me at: agdollplay[AT]yahoo[DOT]com. 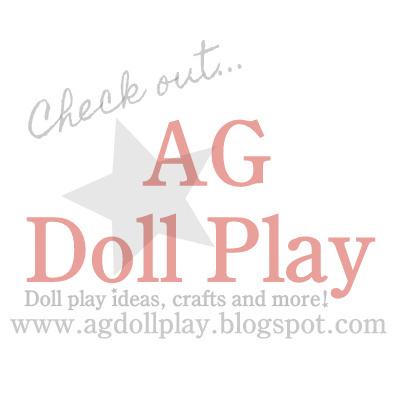 Thank you for your interest in having your things featured on AG Doll Play! The owner(s) of this blog on occasion is compensated to provide opinion on products, services, websites and various other topics. Even though the owner(s) of this blog may receive donated product compensation for our posts or advertisements, we always give our honest opinions, findings, beliefs, or experiences on those topics or products. The views and opinions expressed on this blog are purely the bloggers’ own. I have an Etsy Shop Under the name 123 Mulberry Street and would like some info on giveaways and reviews . Also the cost of advertising. Thanks Sandra! I send you a reply via email. Hi, I have a doll clothes web site www.dolly-duds.com. Please send me info about ads, Etc. Thanks for reaching out Judith! I sent you an email and look forward to hearing from you! Hi. I have an etsy shop called Hey Buckwheat and would like more info on advertising, reviews and giveaways please. Thank you. Would you like to do a giveway or review? If so, please email where to mail the outfit. Thanks. Hi, I am a doll clothes maker and would love to have you review and give away one of my outfits.